I grew up in Saint Petersburg, have been studying there and was a part of international organization in charge of interns coming from all over the world. So, I would say that I am a good ambassador of my city and able to show you the best parts of it. St. Petersburg is a pretty new town, which was founded in 1703 by Peter the Great. Comparing to European capitals and other big cities, my city is super young! Nevertheless, in order to build the city very famous European architects like Bartolomeo Rastrelli and Domenico Trezzini have been invited by Russian authorities to build a city with a Western look. This is why we also call our city “Window to Europe”. In 2011, I moved to Germany where I met Benie from BeeTravelista. My friends in Germany always wished to go and explore Russia. So, in 2016 I took them for a trip to St. Petersburg and Moscow, we have stayed 5 days in St. Petersburg and 4 days in Moscow. 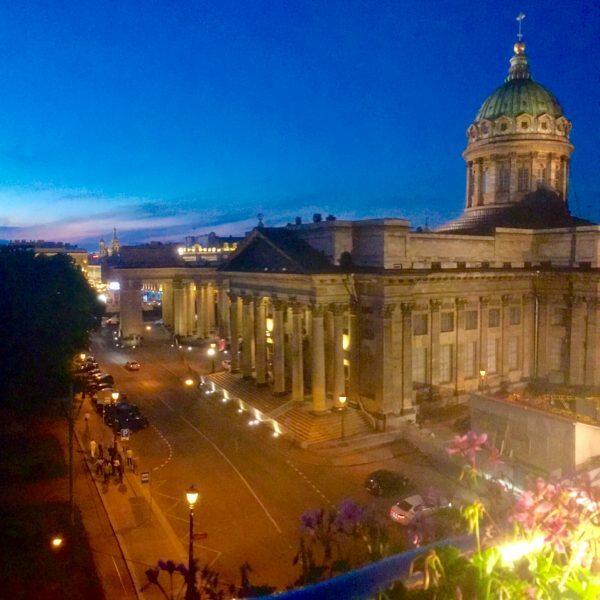 First tip from my side, if you ever decide to visit St. Petersburg – aim always for summer season, where you can totally enjoy the romantic vibe in the air while it’s a season of white nights (longest day is on June 21). We have booked airbnb in the city center (very close to metro station Mayakovskaya); where apartment windows were facing the yard side, so it was very calm, although we were right in the heart of the city. Airbnb was not pricy at all; we paid around 20EUR per night per person. We had a very limited time, so I had to narrow down the sightseeing program to the most important places and activities. First night when we arrived, we went for dinner to Georgian Restaurant Hochu Harcho (delicious!) 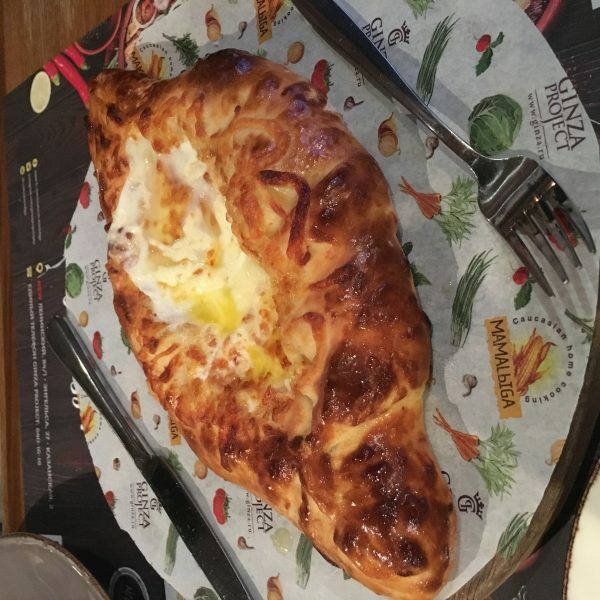 – do try “Adjaruli Khachapuri” (Хачапури по-аджарски), a Georgian cheese bread. 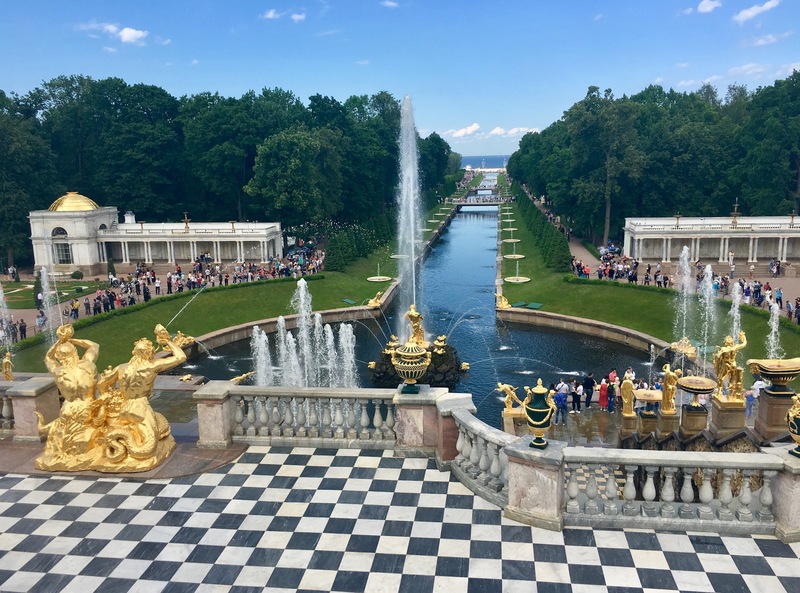 The next day we headed a bit outside the city – to Peterhof. It is an ex summer residence for Russian tzars. It has a huge fountain park and a very beautiful palace. 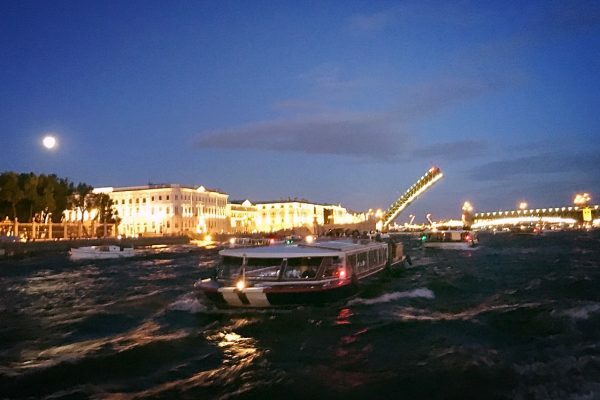 To get to the park you can take speed boat from the city center – takes just 30 min. Probably going by car is cheaper, but with the boat you save a lot of time and avoid the busy traffic. After Peterhof, you can head to Church of the Savior on Spilled Blood (one of the main attractions of the city) which resembles the Saint Basil’s Church in Moscow. Later you can explore that neighborhood of the city. 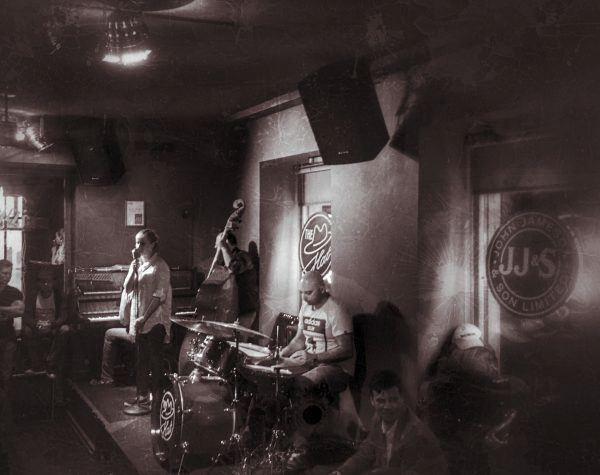 Later in the night, you can enjoy a live jazz bar The Hat (Shlyapa in russian). They start playing around 9/10 pm. The day started with a trip to Peter and Paul Fortress. This is one of the first constructions in St. Petersburg, which was built in the times of Peter the Great. There you can find a number of museums and galleries, but I prefer to spend time outside if the weather is good – so I would advise to you to take a walk on top of the fortress wall. The eve was spent strolling the Nevsky Prospect. Walk around the city center along the channels and small rivers towards Isaac’s Cathedral – one of the most impressive buildings in St. Pete (in my opinion). Do go upstairs to the viewing point and enjoy the great panorama of the downtown (also working late hours during white nights season). 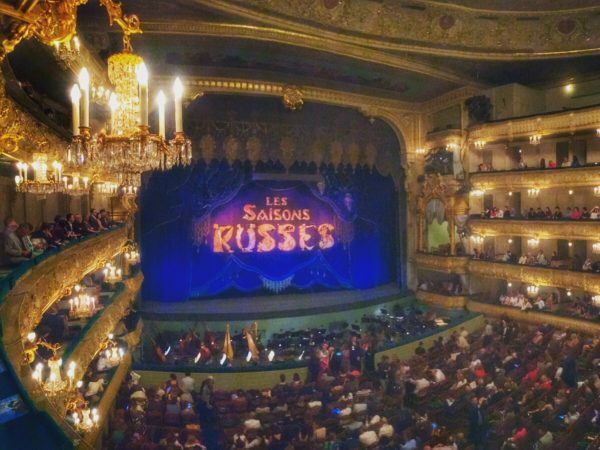 In the evening, we had tickets for a ballet performance at Mariinsky Theater, in summer they have many performances and festivals – so you might end up at the pretty cool event there. Russian Ballet is something you do not want to miss out (if you love theater as much as I do). Just make sure that you book well in advance. Oh, and before the theater, we had dinner at another local gem, called Teplo. You can walk after dinner to the theater. 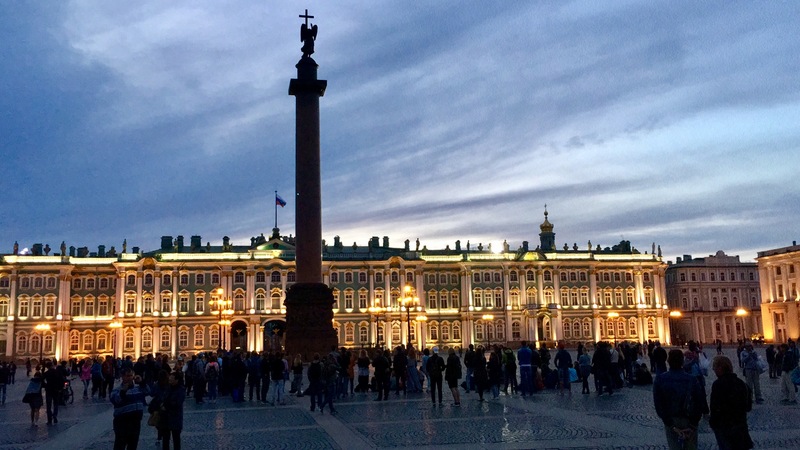 Next day we took a walk in the city center and visited Hermitage – the biggest museum and also an ex-winter residence for Tzar family of Russian Empire so I would say Hermitage is a must see once in St. Petersburg. It is quite big plan good 3 to 4 hours at least. If you like paintings I would suggest visiting Russian Museum as well. 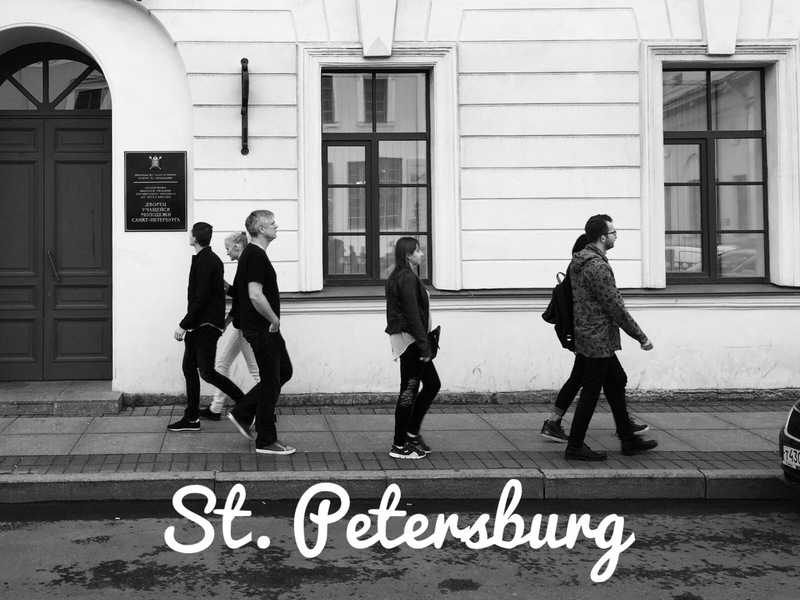 Walking in St. Petersburg is like a drug for me – can’t get enough of that. You can discover new things in places you have been hundreds of times. In summer the city is alive, people are mostly in a good mood, in some corners you can see people dance bachata or tango. Some artists are working on their paintings while sitting in the park or at the square. The romance vibe I mentioned is literally everywhere. Dachniki – Dacha kinda style (how Russian suburban house looks inside), russian food is served here. It is a must! I am Russian, but I was traveling with friends who did need visa for Russia and I figured out that Russia visa needs some planning and you need to investigate the process in the country you are based. The visa requirements are very different for different passports even if you are applying from the same place. If you are an EU citizen, the process should not take long and is not comlicated, especially if you use russian travel agency services. For some other countries process may differ, my advice would be to check visa requirements in advance (before ticket purchase) as sometimes only visa processing time takes up to 30 working days (BeeTravelista can confirm as it was same for her on Pakistani passport). 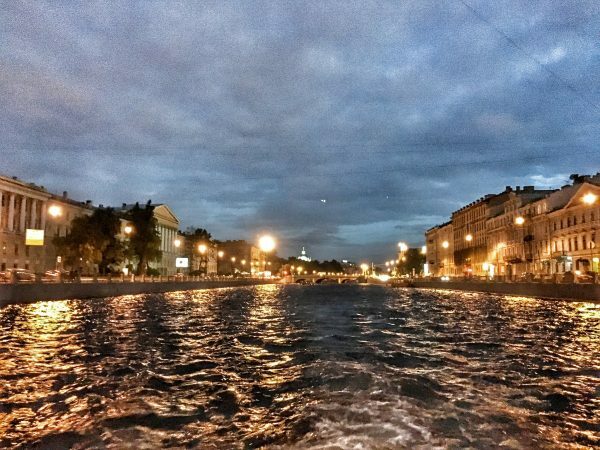 Do go to St. Petersburg for white nights (June-July). Enjoy nice Russian and Georgian food all over the place. The restaurants in SP are both a treat for the stomach and the eyes. Take the night boat trip in those white nights and see the opening of bridges. 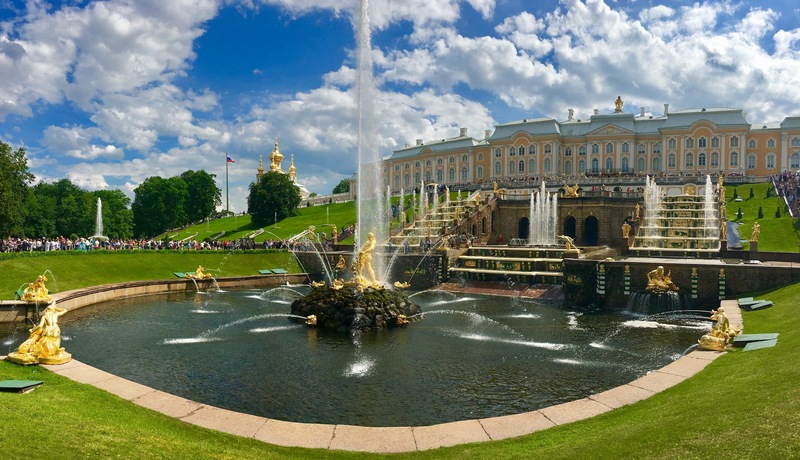 Go to Peterhof and imagine yourself living at that summer royal residence. 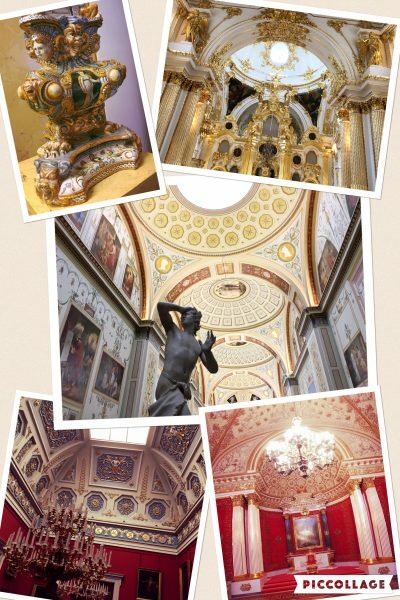 Take a tour in Hermitage. And walk in the city a lot – it is really amazing: architecture/ going out/ even the sky J. Last but not the least, I would suggest you to buy a sim card at the airport once you land. 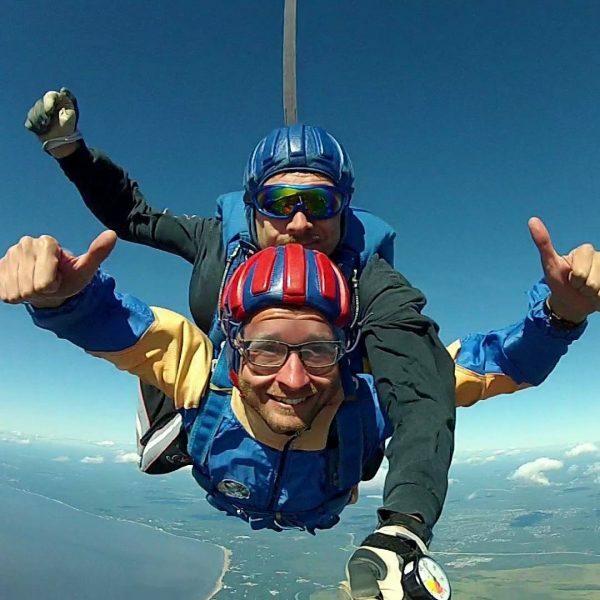 It is super cheap and has very good internet connection – this will help you to find your way around and to order Uber or taxi (yandex.taxi has a great service too – but they have been merged with Uber Russia recently). Tip: Always avoid those private taxis on the streets – use applications on your phone like Uber to order taxis – normally does not take longer than 10 min for them to pick you up. Taxi drivers hardly speak any English, so have the address handy and just go with the meter. I hope you enjoy your trip as much as I do every time I go back home! Spasibo (thank you) for reading! P.S. If you like the post, I am thankful if you share! 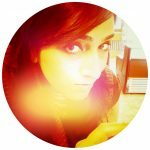 Yah, the visa process for me (as a Pakistani) was also very tough and very long. And for some other countries also. Such a pity as it demotivates you to visit such a nice place. That midnight boat trip looks so cool! If I ever make it there I’d love to do that. Oh, this is wonderful! I’ve been to St. Petersburg for a quick trip, but it’s always appreciated when a local share tips and advice! Would need to remember some of these when I go back to St. Petes – it’s such a delightful city to explore! Glad you liked it Jin! I have traveled through Russia quite a bit, to Moscow and Siberia, but I’ve never made it to St Petersburg. I would love to take the boat on an evening cruise, and admire the beautiful architecture of the city. The Church of the Saviour on spilled blood looks majestic, it reminds me of the St Basil’s church from Moscow. Yah it is definitely a must. Walking in St. Pete is just amazing. Everything looks so opulent! 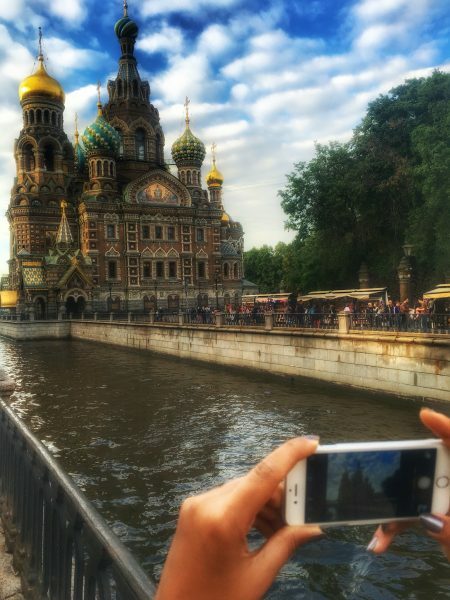 St. Petersburg isn’t quite what I had imagined – looks like a good place to visit in summer/spring! Absolutely! Just check visa requirements as Russia visa is one of the toughest (long time needed). Yah this cheese bread is love! I studied Russian in university and have always been fascinated by it. I really want to go and see St. Petersburg, especially. Walking around the Hermitage, eating local food, all of this would be a dream!